Kids Eat Free: Come on out to AT&T Field on Monday for Kids Eat Free. Every kid 12 and under will receive a voucher for a FREE hot dog and drink upon entrance. Vouchers can be redeemed at any of the main concession stands on the concourse. Enjoy Kids Run the Bases presented by Great Clips after every Lookouts game. Food City Tuesday: Fans who show their Food City ValuCard on the day of the Lookouts Ticket Office will receive buy one get one general admission tickets to that night's game (Limit 4). Thirsty Thursday: Join us for our 1st Thirsty Thursday of the year and enjoy $1 draught domestics including $2 Big River Craft Beer and $1 fountain soft drinks. Thirsty Thursday Drink Specials are available at the Lookouts main concession stands, the Big River Beer Garden and the Budweiser Party Deck. Mars Wrigley Night at the Park: Meet and greet with your favorite M&M characters and pick up some free candy on your way out courtesy of Mars Wrigley Confectionery. Postgame Fireworks: Enjoy a spectacular postgame fireworks display after the game. Friday's Fireworks are one of 18 fireworks shows this season at AT&T Field. 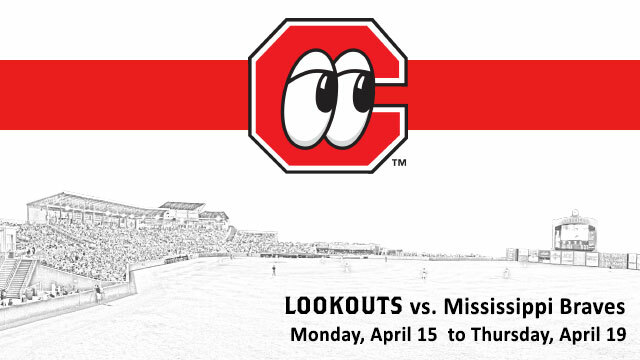 Tickets are available at Lookouts.com, by calling (423) 267-2208, or by visiting the Chattanooga Lookouts Ticket Office. Run the Bases: After every Lookouts home game kids are invited down to the field to run the bases presented by Great Clips. Fans can line up at the top of section 104 on the 1st base side of the field after the game to run the bases. Run the bases is weather permitting. ABOUT THE LOOKOUTS: The Chattanooga Lookouts, a founding member of the Southern League in 1885, are the 2015 and 2017 Southern League Champions and the Double-A affiliate of the Cincinnati Reds. The Lookouts 2019 season is presented by FirstBank. The Lookouts play their home games at AT&T Field, located in downtown Chattanooga. For more information, keep up with the Lookouts year-round at www.lookouts.com, or by following us on Facebook, Twitter and Instagram.